Join the discussion on our forums! 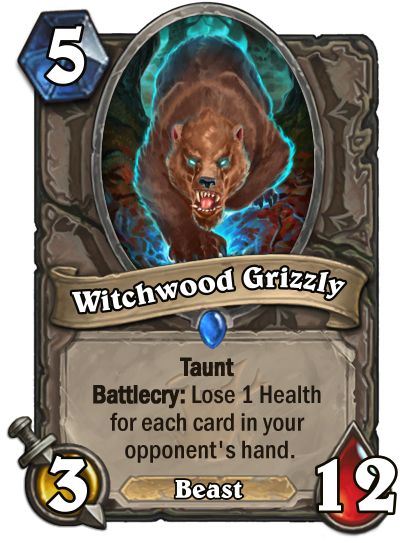 Come discuss Witchwood Grizzly over in our dedicated Witchwood Grizzly discussion topic. [x]TauntBattlecry: Lose 1 Healthfor each card in youropponent's hand. You know what they say about people with big hands? Small bears. "We also discussed how to address spectral beast cards like Witchwood Grizzly and Arfus. Are they Beasts or not? For Witchwood Grizzly, we liked the gameplay interactions that it had with Witching Hour and Kathrena Winterwisp. We decided to update its art to make it look like a beast instead of a ghost. Arfus meanwhile, is seeing a lot of play because he is being Discovered by Deathstalker Rexxar, which is really fun, so we're leaving him as is for now." I tend to disagree with your first statement. In World of Warcraft (which Hearthstone states it was at least originally based upon), spirit beasts are dead, but they are still considered Beasts. That is why Hunters can tame them. I have my fair share of qualms with aggro decks but come on, they run out of cards fast often enough and that thing is a bit too big, not to mention it's resurrectability and duplicatabily. Yeah, those aren't exactly words but you get my point XD. Pulling this with Master Oakheart is really really good. You won't see it because it has a keyword and special text. People will run this in Priest decks with "Lady in White". Pop out a 12/12 taunt on your 7th if you are RNG lucky. Cyclopian Horror sends it's regards. Hot damn. This would be amazing in recruit decks. I would assume it gets a new health cap, since it would be stated otherwise, but yknow Blizzard and their consistency. Design-wise, I think it's health would be capped since this card would be significantly stronger in some classes than others (Priest, Druid, Pallys, especially Shamans with Ancestral Healing etc. all have burst healing).